First of all I need to apologize to a fellow cruise critic member, Kevin,(I don&apos;t recall his handle) for us missing the meet and greet he arranged. Being only our second time cruising and my brothers first we lost track of time on Sunday and missed the gathering, so we&apos;re sorry Kevin if you read this! Now on to the review, a bit about us, we are both in our early 50&apos;s and my brother and sister in law are early/mid 60&apos;s. We are from mid Maine and they are from northeast Vermont so we needed some sun and warmth! Embarkation was smooth, we arrived at the port around 11am and I think we were on the ship by noon-ish so not bad overall. We proceeded to the Social to make reservations for Go Karts while they were still available. While we were in there I noticed the sign for the Vibe Beach Club passes already sold out. Obviously this is a perk for the multiple cruise folks that get to board first, oh well maybe someday! Once we made reservations we went to get our first drink and explore the ship, all we could do is say WOW, this ship is beautiful and huge, especially for us newbies! Our cabin was available to drop our things off around 130pm or so and we went to check them out. 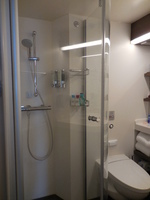 We had balcony cabin 11854 and my brother had 11852.They were just the right size for two of us, we didn&apos;t feel cramped and had plenty of storage. We were part of the Casinos at Sea program so we had a bottle of champagne and our players cards in the cabin when we arrived, nice touch! The players cards were put to good use over the course of the cruise and we donated to the next possible winners! On to Dining, I made reservations in advance of the cruise for the Manhattan room, Los Lobos, Teppanyaki, and La Cucina (for Valentine&apos;s Day of course). Out of the 4 Teppanyaki was the best, hands down, it was excellent and our chef was entertaining. We also ate at the Garden Cafe&apos; a few times for quick bites and had room service for breakfast one morning. Food was good overall and the specialty dining rooms were above average except for La Cucina which was a bit on the blah side, not at all what we expected but still ok. The only entertainment group we saw was the Beatles tribute band in the Cavern and they did a great job. I was surprised however that it was so short, maybe 45 minutes tops and only 1 set. The Go Karts were fun just be prepared to wait for a bit to get on the track, even with reservations. But you&apos;re on vacation so time is supposed to be irrelevant right? As many have said already, the pool area is BUSY on nice days and getting a chair will be impossible unless you are there to claim your spot very early in the morning. 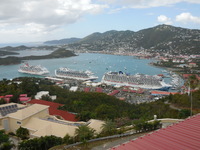 We did a couple excursions in St Thomas, the Legendary Kon Tiki tour and the Skyride to Paradise Point. The Kon Tiki tour and beach stop is a must, very fun and free rum punch, can&apos;t beat that. Views from Paradise point are amazing, it overlooks the whole port area. In Tortola we just did a 2 hour island tour with a local company at the pier for $20 per person, it&apos;s worth it. This island is still trying to get back on its feet since hurricane Irma. The devistation was unbelievable and being closed to cruise ships for a year really hurt the locals. It is sad to see but hopefully now that people are coming back they can continue to rebuild and flourish. In Nassau we just walked around the area near the pier and did not do any excursions. If we end up going back to Nassau on another cruise we will definitely find an excursion that takes us away from that area, way too many people trying to pull you into their shops. One thing I have to say about this ship and it&apos;s staff, AWESOME! We made friends with a few of the staff members, Rossi in the Cavern, Satya and Danny at the Skyline bar, and the two bartenders at Sugarcane (I cannot recall their names). These guys were the best so make sure you visit them in you cruise on the Bliss. I guess that is long winded enough so I will end with this. This was our first NCL cruise and I will definitely cruise with them again. Beautiful ship, great, accomodating staff. A word(ok a few words) to all that complain about the service and the "poor attitudes of the staff" maybe they are not the problem. Remember, you are on VACATION along with 4000 other folks, be PATIENT, they will not run out of food or drinks, you&apos;ll survive, trust me. If you are rude to the staff do you really expect them to be especially nice to you???? Think about it, seriously. We witnessed a lot of unnecessarily rude people, really too bad people have to act this way, life is too short not to enjoy it! Great cruise with a few hiccups! First of all I need to apologize to a fellow cruise critic member, Kevin,(I don&apos;t recall his handle) for us missing the meet and greet he arranged. Being only our second time cruising and my brothers first we lost track of time on Sunday and missed the gathering, so we&apos;re sorry Kevin if you read this! Now on to the review, a bit about us, we are both in our early 50&apos;s and my brother and sister in law are early/mid 60&apos;s. We are from mid Maine and they are from northeast Vermont so we needed some sun and warmth! Embarkation was smooth, we arrived at the port around 11am and I think we were on the ship by noon-ish so not bad overall. We proceeded to the Social to make reservations for Go Karts while they were still available. While we were in there I noticed the sign for the Vibe Beach Club passes already sold out. Obviously this is a perk for the multiple cruise folks that get to board first, oh well maybe someday! 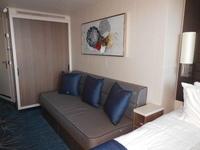 Once we made reservations we went to get our first drink and explore the ship, all we could do is say WOW, this ship is beautiful and huge, especially for us newbies! Our cabin was available to drop our things off around 130pm or so and we went to check them out. 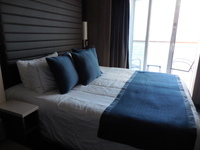 We had balcony cabin 11854 and my brother had 11852.They were just the right size for two of us, we didn&apos;t feel cramped and had plenty of storage. We were part of the Casinos at Sea program so we had a bottle of champagne and our players cards in the cabin when we arrived, nice touch! The players cards were put to good use over the course of the cruise and we donated to the next possible winners! On to Dining, I made reservations in advance of the cruise for the Manhattan room, Los Lobos, Teppanyaki, and La Cucina (for Valentine&apos;s Day of course). Out of the 4 Teppanyaki was the best, hands down, it was excellent and our chef was entertaining. We also ate at the Garden Cafe&apos; a few times for quick bites and had room service for breakfast one morning. Food was good overall and the specialty dining rooms were above average except for La Cucina which was a bit on the blah side, not at all what we expected but still ok. The only entertainment group we saw was the Beatles tribute band in the Cavern and they did a great job. I was surprised however that it was so short, maybe 45 minutes tops and only 1 set. The Go Karts were fun just be prepared to wait for a bit to get on the track, even with reservations. But you&apos;re on vacation so time is supposed to be irrelevant right? As many have said already, the pool area is BUSY on nice days and getting a chair will be impossible unless you are there to claim your spot very early in the morning. 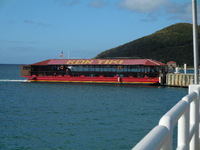 We did a couple excursions in St Thomas, the Legendary Kon Tiki tour and the Skyride to Paradise Point. The Kon Tiki tour and beach stop is a must, very fun and free rum punch, can&apos;t beat that. 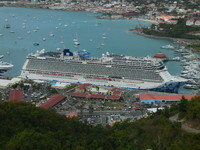 Views from Paradise point are amazing, it overlooks the whole port area. In Tortola we just did a 2 hour island tour with a local company at the pier for $20 per person, it&apos;s worth it. This island is still trying to get back on its feet since hurricane Irma. 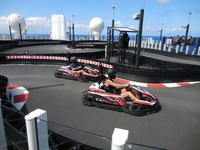 The devistation was unbelievable and being closed to cruise ships for a year really hurt the locals. It is sad to see but hopefully now that people are coming back they can continue to rebuild and flourish. In Nassau we just walked around the area near the pier and did not do any excursions. If we end up going back to Nassau on another cruise we will definitely find an excursion that takes us away from that area, way too many people trying to pull you into their shops. One thing I have to say about this ship and it&apos;s staff, AWESOME! We made friends with a few of the staff members, Rossi in the Cavern, Satya and Danny at the Skyline bar, and the two bartenders at Sugarcane (I cannot recall their names). These guys were the best so make sure you visit them in you cruise on the Bliss. I guess that is long winded enough so I will end with this. This was our first NCL cruise and I will definitely cruise with them again. Beautiful ship, great, accomodating staff. A word(ok a few words) to all that complain about the service and the "poor attitudes of the staff" maybe they are not the problem. Remember, you are on VACATION along with 4000 other folks, be PATIENT, they will not run out of food or drinks, you&apos;ll survive, trust me. If you are rude to the staff do you really expect them to be especially nice to you???? Think about it, seriously. We witnessed a lot of unnecessarily rude people, really too bad people have to act this way, life is too short not to enjoy it! Very nice cabin, room enough for two of us. Being next to an angled balcony cabin (11856) allows a clear view towards the stern of the ship without looking "through" your neighbors balcony. Plenty of storage space for belongings. A lot of shops and a lot of people. Excursions would probably make it a worthwhile stop. This was a lot of fun, I would highly recommend this trip.